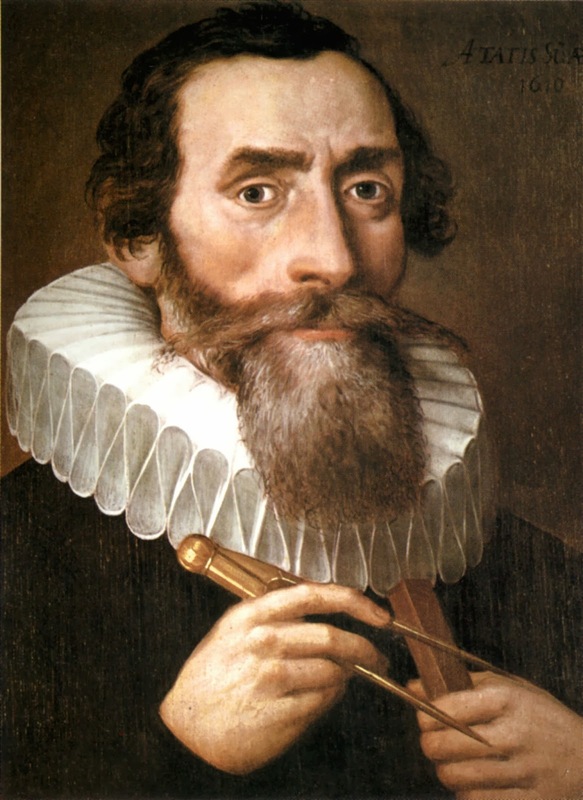 Kepler was as astronomer, geometer and physicist go German origin. He is best know for his discovery of the three laws of planetary motion, based on the painstaking observation of Tycho Brahe and his co-workers (including Kepler himself). These laws describe how the solar system is organised. He founded modern optics by presenting the earliest correct explanation of how human beings see. He was the first to describe accurately what happens to light after it enters a telescope and he deigned a particular form of it. His ideas mark a change from the ancient geometrical description of the heavens to modern dynamical astronomy, into which he introduced the idea of force. His interest in perfect figures led to a number of results in solid geometry. Ptolemy, in second century A.D., developed a theory called Geocentric theory. According to this theory, the Earth was condidered to be the centre of the universe. It was postulated that the planets, the Sun and stars move around the Earth. Aryabhatta, the famous Indian astronomer and mathematician stated in 498 A.D. that the Earth revolves not only around the Sun but also about its own axis. Nicolaus Copernicus, a polish astronomer, gave heliocentric theory in the year 1543. According to this theory, Sun is at rest and all the nine planets move around the Sun in circular orbits. The nine planets are Mercury, Venus, Earth, Mars, Jupiter, Saturn, Uranus, Neptune and Pluto. J. Kelper, a German astronomer, analysed the data on planetary motions, collected by a Danish astronomet Tycho Brahe. This analysis led to the formulation of three simple laws of planetary motion. While the first two laws were enunciated in the year 1609, the third law was stated in the year 1618. Each planet moves in an elliptical orbit with the Sun at one focus. The image shows an ellipse traced out by a planet around the sun. 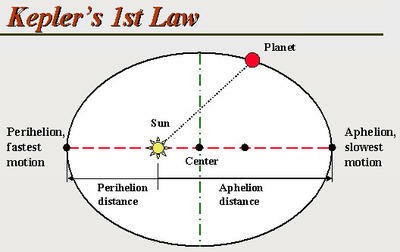 The closest point is P and the farthest point is A. P is called the Perihelion and A the Aphelion. The length of the major axis equals the sum of th planet-sun distance at Perihelion plus the planet-sun distance at aphelion. The lenth of the major axis is 2a. Clearly half the distance AP is length 'a' of the semi-major axis. The figure also shows minor axis of length '2b'. The speed of planet varies in such a way that the radius vector drawn from the Sun to a planet sweeps out equal areas in equal times. The areal velocity (it is the area swept by the radius vector in unit time) of the planet is constant. Also, the planet covers unequal distances S1, S2 and S3 in equal times. This is due to the variable speed of the planet. Maximum distance is covered in a give time when planet is closet to the Sun. This shows that the velocity and therefore, th kinetic energy of the planet is maximum when it is closest to the Sun. When th planet is farthest from the Sun, its velocity and, therefore, the kinetic energy is minimum. However, the total energy of the planet remains constant. The square of the period of revolution of a planet around the Sun is proportional to the cube of the semi-major axis of its elliptical orbit. Let, T = Period of revolution of planet around the Sun. According to Kepler's third law,T2∞R3 or T2=KR3 where K is a constant for all planets. Let T1 and T2 be the periods of any two planets around the Sun. Let R1 and R2 be the lengths of their respective semi-major axes. Since different planets are at different distances from the Sun, therefore, their time periods are different. Pluto, which is farthest from the Sun completes one revolution around the Sun in 247 years. This period of revolution of Mercury, which is closest to the Sun, is 81 days. Keplr's laws are applicable whenever inverse square law is involved. Thus they are applicable not only to the solar system but also to the artificial satellites as well as to the moons going round the planets.